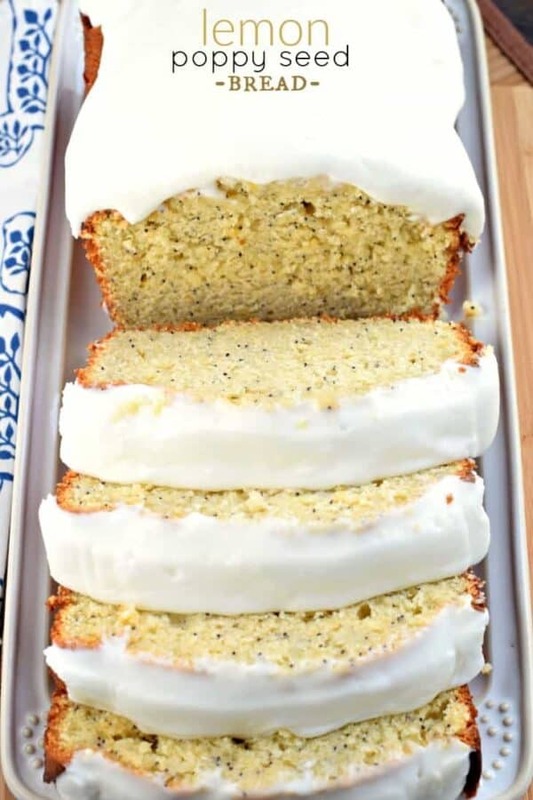 A delicious, moist Lemon Poppy Seed Bread recipe topped with a Lemon Cream Cheese frosting! I’m obsessed with Lemon right now. 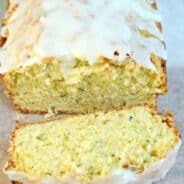 It all started with this copycat Starbuck’s Lemon bread recipe! Then came these lemon poppy seed muffins. And now, today’s Lemon Poppy Seed Bread recipe was born! Do you ever get stuck in a flavor rut? Not that a rut is a bad thing. I mean, working out every day, good rut to be in. Eating lemon pastries for breakfast, another great rut! But sometimes, I need to go through this to get past this, ya know? So bear with me as we eat ALL THE LEMONS for breakfast! First. The amount of fresh lemons. 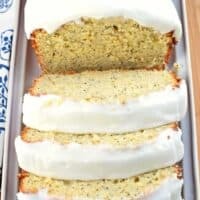 I use SEVEN lemons, zested and juiced to make this delicious poppy seed bread. While I don’t use the juice in the base of this recipe, I do add it to the simple syrup. Second. THE SIMPLE SYRUP. ha! 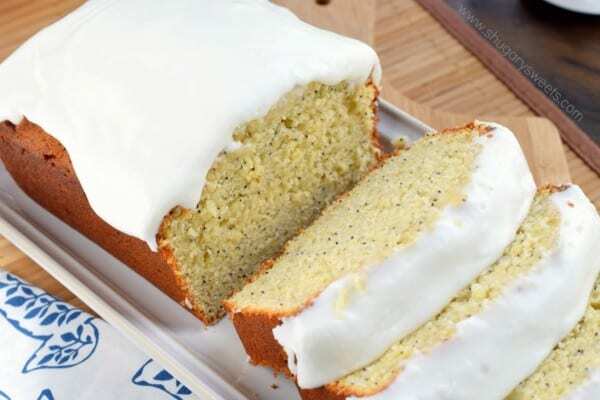 Once you’ve baked up your loaf of Lemon Poppy Seed bread, you’re going to whisk together some sugar and fresh lemon juice in a saucepan, until all the sugar is dissolved. Then, drizzle this delicious liquid all over the top of your bread. 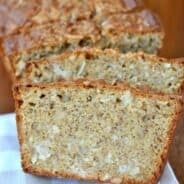 Not only does this infuse MORE lemon flavor, but it adds moisture to this already moist bread! Third. The glaze. Using more of that fresh lemon juice, you’re going to combine it with some cream cheese and powdered sugar. Some call this glaze. Some call it frosting. Either way it has all the flavor of lemon, with the zing of cream cheese! Fourth. This bread recipe makes TWO loaves. Yes. Two. If you’re going through the work of baking, why not have a delicious abundance! 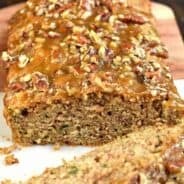 This bread can be placed in the freezer (before or after adding the glaze, your choice). Also makes a great gift for family and friends, or neighbors in need of a cheerful treat! 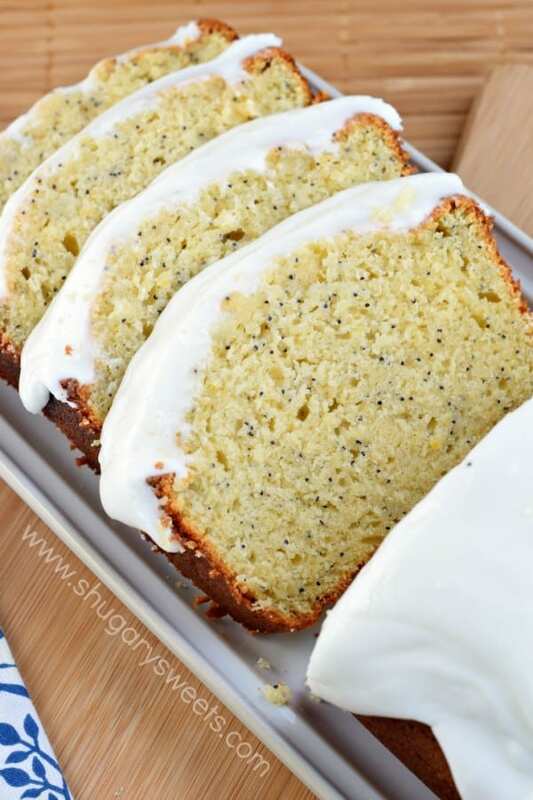 I hope you love this Lemon Poppy Seed Bread as much as we do! ENJOY! In a large mixing bowl beat butter with sugar until fluffy (about 2 minutes). Add eggs, one at a time, beating until fully incorporated. Beat in lemon zest, 1/4 cup of lemon juice, vanilla extract, and poppy seeds. Beat in flour mixture and yogurt alternatively until fully combined (in about 3 additions). Pour batter into TWO 9x5-inch loaf pans that have been greased with baking spray. Bake in a 350 degree F oven for 40 minutes. Cover loosely with foil and bake an additional 20-30 minutes until toothpick inserted in the center comes out clean. Remove from oven. In a small saucepan, whisk together the simple syrup ingredients over low heat. Whisk until sugar is dissolved. Poke holes in lemon loaf using a toothpick. Pour syrup over loaves. Remove from pan and cool on wire rack. For the glaze, beat together the cream cheese, powdered sugar and lemon juice. Add more or less lemon juice to get desired consistency. Pour over cooled bread. Allow to set (about 15 minutes). Slice and enjoy. Store in airtight container for up to 5 days. ENJOY! 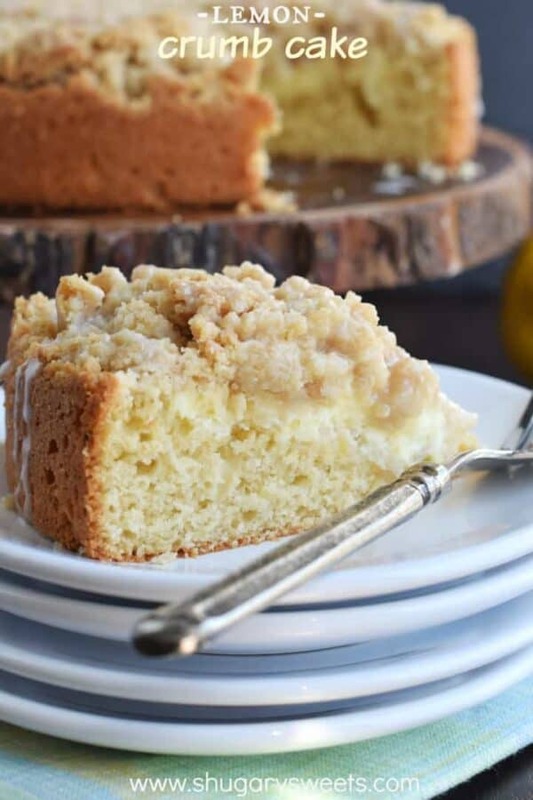 This Lemon Crumb Cake is one of my favorite breakfast pastries! Have you tried it yet? 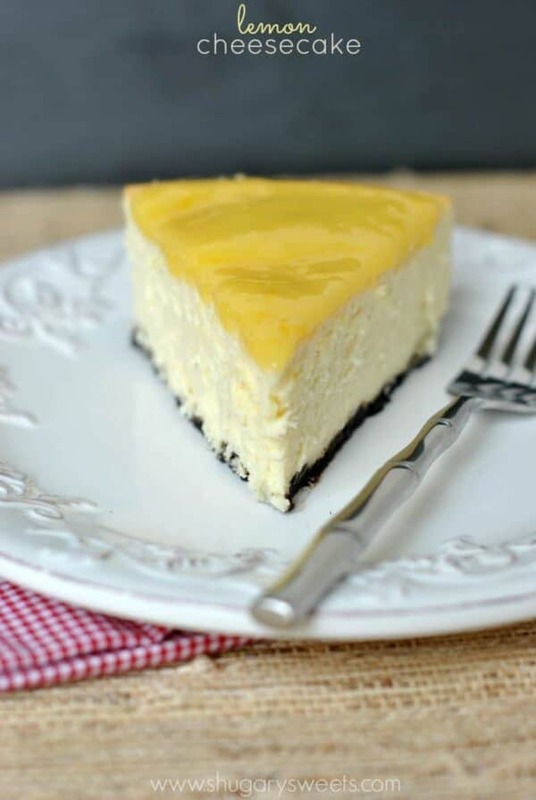 Lemon Cheesecake: delicious cheesecake recipe with a homemade lemon curd on top! 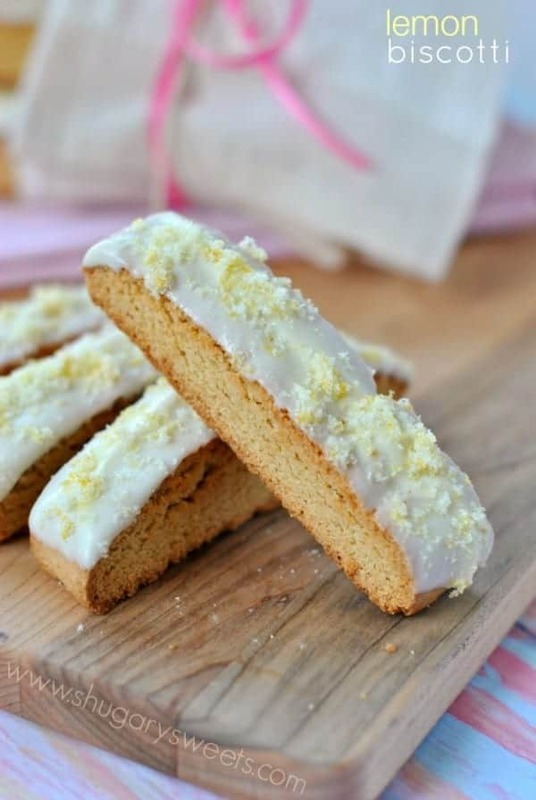 Lemon Biscotti: a sweet breakfast that is perfect dunked in your morning coffee! I think I’ve been on a PB and chocolate baking rut for, oh, 15 years now. 🙂 But I hear ya. This past week I bought a ton of limes and just baked them all into something or other. It was fun! And this bread is great. Two loaves is better than one! Especially with thick happy glaze on top. Whenever I’m in a chocolate rut, I too always reach for lemons. In the springtime, lemony desserts are really on my mind 🙂 This bread looks delicious! Poppy seeds is the best way to add texture to anything. And a lemon glaze? Delish. This sounds incredible! Lemon desserts make me think of spring and I love that you glazed this! And that it makes two loaves, bake once, eat twice 🙂 Or more than twice…ha! I love lemon poppy seed. It would be dangerous to have this in the house. I want it though. Looks so delicious. Aren’t seven lemons a bit too much? If I don’t want the bread to be very sour, can I use less lemons for the recipe? Made these loaves for a pot luck tomorrow. I am hoping the glaze is okay. The above recipe says 1/4 reserved lemon juice. I assumed it meant 1/4 cup, so I am hoping it sets well.